Taavi Oramo’s professional conducting career was launched with two short-notice jump-ins during the 2017/18 season with Tapiola Sinfonietta and the Finnish Radio Symphony Orchestra for which he received glowing reviews: ​“he shaped the piece’s passion, rhetoric, sighs and storms with singing softeness and sensitivity” said the Helsingen Sanomat on his performance of Haydn Symphony No.49 with the Finnish Radio Symphony Orchestra. The newspaper also praised his performance in Tapiola ​“The multi-talented Taavi Oramo is only taking his first steps as a conductor but it’s immediately clear that another Finnish conductor is on his way to an international career”. 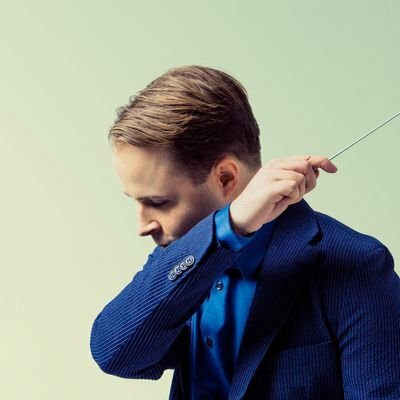 The 2018/19 season sees re-invitations to Tapiola Sinfonietta, Lahti Symphony Orchestra, Norrköping Symphony Orchestra and debuts with the Helsinki Philharmonic Orchestra, Oulu Symphony and Turku Philharmonic Orchestra, as well as two world premieres of operas by Heinz-Juhani Hofmann and Lauri Kilpiö.A major creative outlet has been Oramo’s experimental electroacoustic group, Tölöläb, which combines woodwinds with live electronics to create music uninhibited by genre and conventional expectations. Recent performances with Tapiola Sinfonietta, with Oramo on the podium, combined live improvised interludes interspersing the movements of Webern’s Symphony Op.21 and Magnus Lindberg’s Jubliees. Producing concerts in venues ranging from the grittiest bars and techno parties to sacred spaces, in 2018 Tölöläb collaborated with experimental jazz group Elifantree to compose and record an album at Pekka Kuusisto’s ​‘Our Festival’. Tölöläb’s previous projects include Vaeltaja (Traveller), a piece designed by Heta Aho performed in a moving tram using stories collected from strangers as material performed as part of Eloa Festival 2016, and Varjele a shadow dance piece performed at Helsinki Festival 2017. As a singer Oramo has focused on contemporary and early music. In 2018 he sang tenor arias in St John Passion with Finnish Baroque Orchestra and Lahti Symphony Orchestra, and featured in a staged production of Monteverdi Vespers produced by Helsinki Baroque Orchestra and Zodiak Dance Theater. As a clarinetist he has performed as soloist with orchestras in Kuopio, Joensuu and Lappeenranta as well as Ostrobothnian Chamber Orchestra and contemporary music group New Times Ensemble. Oramo studied conducting at the Panula Academy under Jorma Panula and at Sibelius Academy under professors Atso Almila and Hannu Lintu. He is a founding member, former executive director and Chairman of the Board at Eloa Culture Company, which produces multidisciplinary chamber music events.